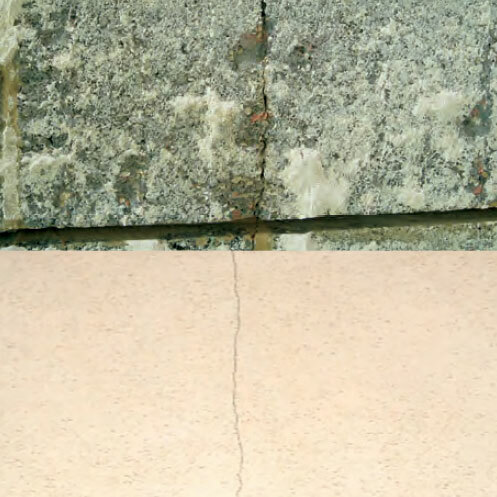 There are two different types or repair, repair method 1 for aesthetic repairs to fine cracks and repair method 2 for remedial to damage/hollow or defective render. In both cases it is a reasonable expectation for the repair quality to achieve texture and alignment consistency with the existing render. It is more difficult to achieve colour shade matching, particularly with strong pigmented colours and renders that have been in-situ for a while. It is imperative that care and patience with attention to detail is employed for a successful outcome. Drench the affected area with undiluted weber CL150 using a brush or sprayer. Leave the area for 48 hours to ensure weber CL150 has killed any algae which may be present on the elevation. Wash the area using a pressure washer set to low pressure with a fanned jet action taking care at exposed edges. Using a mini disc cutter, run a cut through the crack in order to open the crack to the thickness of the cutter blade. Dry mix by volume 6 parts weberpral M with 1 part weber arêtes chrono. Then add a dilution of 2 parts clean water mixed with 1 part EVA or waterproof external grade PVA to produce a workable consistency. (Please note it is imperative that the additive to water ratio is measured correctly because, if the dilution is too strong, this will affect the finished colour of the repair). Fill a cartridge with the mixed product and load into a cartridge gun. Cut the nozzle to suit the crack width and inject a bead of product into the crack ensuring that you do not overlay the material over the existing render but that you form a protruding nib of material 2-3mm in front of the line of the existing render. Allow the repair material to stiffen for a period of between 20-40 minutes (dependent on temperature) then remove the nib carefully by using the edge of a small filling knife. If the scraping process is completed after the 40 minute period, it is likely that a much lighter shade of repair will be achieved than the existing render, which will not blend in. Using a disk cutter cut a straight line 50mm either side of the crack, then remove the render back to the substrate between the cuts. Stick a masking tape tight to the outer edges of the cut edges then prime the inside cheeks of the render cuts and exposed substrate with a dilution of 3 parts clean water and 1 part EVA or waterproof external grade PVA. Whilst the primer is tacky, skim a layer of mixed weberpral M including weber arêtes chrono if desired into the void. Immediately push into the applied material a piece of Weber alkali resistant mesh cloth cut to width followed by a further coat of weberpral M applied over the mesh so as to fill the void and overlay the product onto the masking tape and past the existing thickness of render by 3mm. Allow the product to pick up sufficiently until it is firm enough to allow for the scraping process and remove the 3mm of excess product back to the line of the existing thickness of render. The edge of a filling knife could be adopted for this process. Brush the product down to remove the scraping dust and remove the masking tape. Scraping too early or too late in the set of the material will affect the cured shade of the product and will prevent a colour match being achieved to the existing render. webersil P is a high-performance mineral paint that gives exceptional long term durability and performance. Providing that the monocouche render is clean, dry and sound, a direct application of the webersil P is appropriate. The first coat of webersil P should be diluted with between 10% and 15% clean water and the paint then applied with a medium pile wool paint roller. 24 hours later a second coat is applied, this coat should be undiluted. The application should be in a criss-cross pattern ensuring that the paint is applied evenly minimising any effect on the scraped texture of the monocouche. Spillages do stain and are difficult to remove so protect vulnerable areas thoroughly and wear suitable protective clothing.